Jammu: Amid ongoing protests by people of Kargil over their demand for rotational divisional headquarters, Jammu and Kashmir Governor Satya Pal Malik has said a committee of secretaries has been formed to ensure justice for the district. “The divisional status for Ladakh was a long-standing demand (of the people of the region). We have formed a committee of secretaries which will look into the issue so that Kargil gets justice,” the Governor told reporters on the sidelines of a function in Katra township of Reasi district. 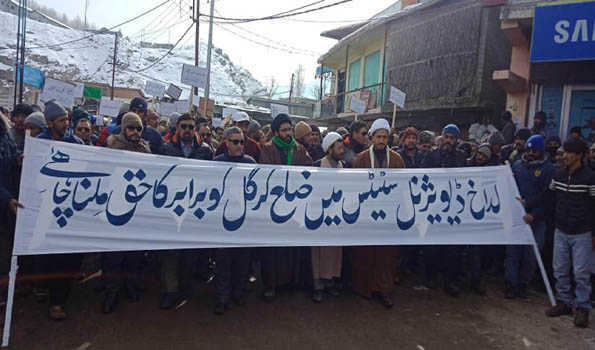 Hundreds of people on Sunday, February 10 protested in Kargil demanding rotational basis headquarters for the newly created Ladakh Division. “It (divisional status) was imperative for both the districts of Leh and Kargil let those talking about it come to power and do so,” the Governor said. The leaders also addressed the gathering at the Press Club, vowing to continue the “united struggle” till the “genuine demands” of the people of Kargil are not met.